I found this used Black double bound body on-line which inspired this project. I love P90 guitars but have never had a P90 Tele, so this is new for me and it's been on my wish list a loooong time. The bridge pickup was already routed for humbucker and I got my carpenter neighbour, James, to route out for humbucker neck, which he did for just £25 – top man, James! It’s lightly aged, not relic'd, I suppose trying to look like an older guitar that has been modded from the original. I'm delighted with the way it's turned out and I think it looks pretty mean. Well, I do think Pete Townshend would have liked this in the '80s! It sounds a little like my SG with P90 (a very good thing) it is a little brighter, toppier, snappier. when I roll back the volume it sounds much more Tele like on the bridge at least and can jangle with the best of them. Balances perfectly and comes in about 7 pounds. Very even playing all the way up the neck with plentiful string harmonics to be squeezed out. What's noticeable is that the string tension is very low, more like a Les Paul. That, plus the P90s, means it just cries out for a bit of tube amp gain and go all widdley widdley . Neck: Allparts 10" radius C neck, rosewood fingerboard, thin vintage nitro finish by @rexter ;Jon Rexter Crawford of Rexter guitars https://rexterguitars.co.uk/ UK). Always great work, Jon! Ebonising, edge rolling and ageing by me. Nickel Gotoh tuners. Unbleached bone nut from acousticelectricuk (eBay), finished by me. Looks great and nice spec. Looks excellent! How did you get the rosewood so dark? How did you get on with the lake placid blue body you bought from me? Hi. I use fine steel wool to prep it nice and smooth then use Dylon black leather dye and leaave it for 24 hours. Then rub in a little walnut oil. I use brown leather dye on the dot markers to darken them make them look a little more like clay. This board was pretty dark already, but with the black body I wanted an ebony type look. The LPB body just awaits it's neck which I'm preparing. Lovely body - that's going to look great . Lovely job. I do like a bound edge Tele. That's flawless and really classy with the binding. No Darling....I've had that ages. Gorgeous build Richard and thank you for the mention! I'm getting really into telecasters myself at the moment... been bitten by the bug. You're probably part of the cause with all the nice ones I did for you last year! Cheers Jon. Yes the neck on this was one you did for me in August last year, I think. Nice one! 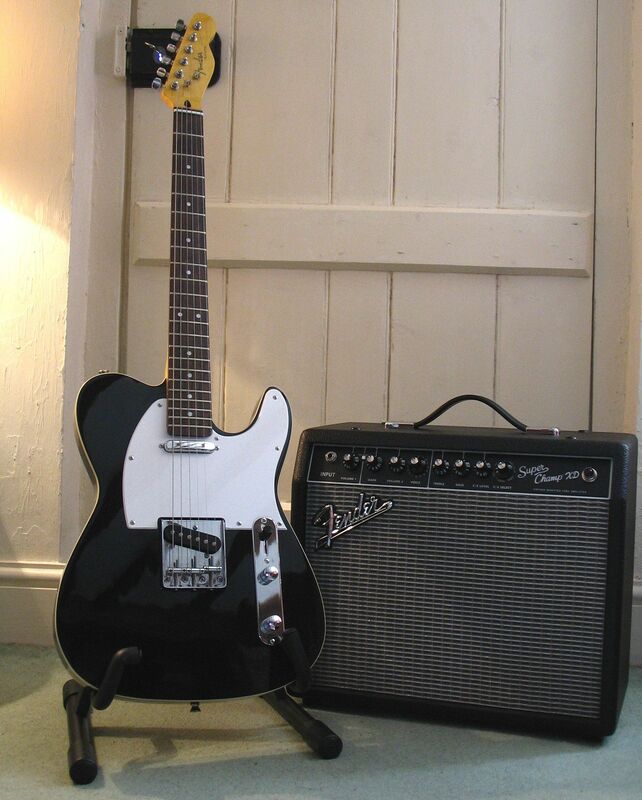 I think my next Tele will be a sparkle double bound.. but I think maybe a summer project. That summer project sounds fantastic... you know where I am! If you don't mind me asking, how much did you spend on it? Cheers I do indeed! thanks Jon best wishes. About £660 all told. Not cheap, but then far less than a new bog standard MIM these days. And this is unique to my exact specifications so I'm being my own cheap Custom Shop. I spend a while on-line sourcing pre-owned parts wherever possible to minimise the costs while keeping the standard as high as possible. I also had some bits in my parts drawer. I just use the dining room table as my workshop when I've got free evenings. Not using pre-owned parts sends the price of way up for nice quality stuff. Sites like this dear one keep the costs down. @rexter did me a bit of a deal on the neck because I'd ordered bodies from him. Thank you. That's less than I thought. It's one of those things that's tempting to do but I had no idea how much it would all cost. It's a fair investment of time and care... also you need to have some decent tools including soldering iron but files etc., so there's all that if you're starting out building it helps if you've been doing your own setups. I still get techs to do my frets. This one didn't need Fret work.